Are Those Saints Who Arose About the Time of Christ's Resurrection Still Alive? It is a common conception, often taken for granted, that the saints who arose shortly after Christ are still alive. But what does the Bible say? First of all, let us get the picture clearly in mind. This incident is recorded in Matt. 27:52, 53 which reads as follows: "And the graves were opened; and many bodies of the saints which slept arose, and came out of the graves after his resurrection, and went into the holy city, and appeared unto many." These were not the first nor the only people to be restored to life from the dead. In II Kings, the fourth chapter, we read the story of Elisha and the Shunamnite's son, whom he raised to life through the power of God. This young man was resurrected many hundreds of years before Christ and yet Paul says in I Corinthians 15:22, 23 that Christ is the firstfruits or the first to be made immortal as the Son of God (Romans 1:4), and that there is a definite order, Christ first, then afterward - not those saints - but they that are Christ's at His coming. Now God is not the author of confusion. He would not set a definite order of resurrections and then violate that order. And yet, what about the Shunamnite's son, and what about Lazarus (John 11:5), and the widow's son mentioned in Luke 7:14,15? These were all raised before Christ's resurrection. What happened to them? If we cast out preconceived ideas, and merely take the Bible as it is, the answer is very clear. They were not made immortal because Paul states in I Timothy 6:16 that Christ alone, of all men who have ever lived, has immortality. I Cor. 15:22-21 says furthermore: "For in Adam all die, so also in Christ shall all be made alive. But each in his own order: Christ the firsrfruits; then they that are Christ's AT HIS COMING." NO ONE BUT CHRIST HAS BEEN RESURRECTED TO IMMORTALITY TO THIS DAY-but those in Christ will be raised NEXT at His second coming: Jesus said that as the Father raised the dead and made dive (quickened) whom He would, so also would the Son do likewise. (John 5:21). The answer is simply that these people, from the Shunamnite's son down to those raised at the time of Christ's resurrection were made physically alive, undoubtedly healed of the afflictions that might have caused their deaths prematurely, then they lived out their lives-human flesh and blood lives. Since they were only mortal, and now alive, they must have died. THUS we conclude that those people merely lived out a natural human life which had been cut short, then died and are even now awaiting the resurrection. When Should Christians Begin Saving a Third Tithe? 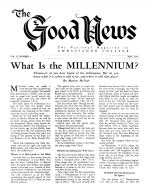 In the December Issue of "The Good News" an article appeared explaining to many of you the three different tithes mentioned in the Bible. The first tithe, of course, is God's and He directs that it be used for the work of the ministry in spreading the gospel. The second tithe, as that article thoroughly explained (Deut. 14:21-27; 16:9-15) is for you so that you can keep the annual festivals which God has commanded His people to observe. But the third tithe is for anyone who is poor and in need. In ancient times, when God's people were an organized nation, the tithe was laid aside within the gates of each city so that the ministers, the strangers, the fatherless and the widows would be adequately provided for (Deut. 14:28,29). Of course. the poor people who needed it were not commanded to lay aside a third tithe, although they could do so if they wished. In the New Testament Church. laying aside help for the needy was also practiced. Paul instructed the churches to take up a collection of fruit so that on the first day of the week when he would arrive everything would be in readiness to rake the liberality of the Gentiles to Jerusalem. See Romans 15:25-28 with I Corinthians 16.1-4. The third tithe is to be saved every third year-the year of tithing for the poor (Deut. 26:12). Since God's people are to work their land for six years and let it lie idle or rest the seventh year (Lev. 25:4-7), it becomes obvious that the years for saving the third tithe are the third and sixth out of every seven. Otherwise a conflict would occur when the year of tithing would be a sabbatical year. Thus the third tithe should be saved the third and the sixth year out of every seven; that is, the third and sixth, the tenth and thirteenth, the seventeenth and twentieth and so on. To make everything as practical ns possible for everyone, God made this help for the poor a tenth or tithe every third year. However, according to the spirit of the law, if you are in such circumstances, that you need to support continually needy members of your family, the church or strangers. it might he more convenient to lay aside about three and one-third percent six out of seven years. Ancient Israel did not give this tithe to foreign nations although it was given to strangers dwelling within the nation. In the same way, we should save it especially for the church, for poor members of our family (I Tim. 5:16) and for the unconverted whom we see have need. It should not be spent promiscuously on worldly charities. Many of you readers have written us requesting to know when to start saving this tithe. Since ancient Israel was to reckon the pears from the time they entered the land (Lev. 25:2), and as we have found NO KNOWN AND PROVABLE WAY to determine exactly how many years have elapsed since that event, we ought to reckon our third year from the time we were converted. This is very wise, because now, when the church is not an organized nation, we need to have various individuals saving a third tithe in different years to take care of all the needs of newly converted individuals. Although God does not require to make up for those past years wherein we failed to save a third tithe since conversion, we should repent for having failed to do so.